A bundle of seemingly endless energy, easily recognized by two white stripes that are bordered by black on its rusty-red sides, has emerged from winter life underground to the topside habitats of all Oakland County Parks. 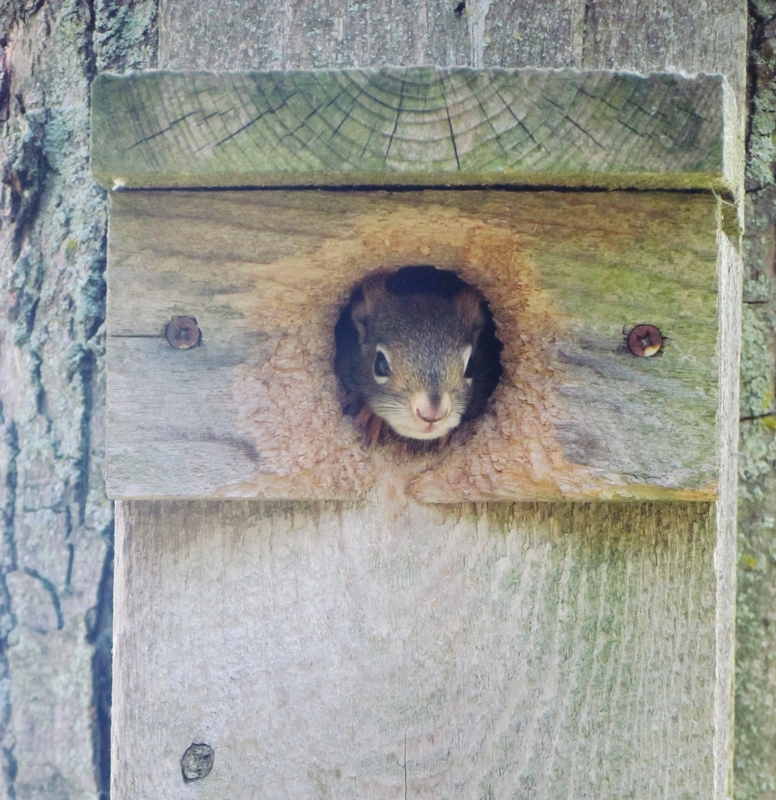 It’s time to welcome the eastern chipmunk. 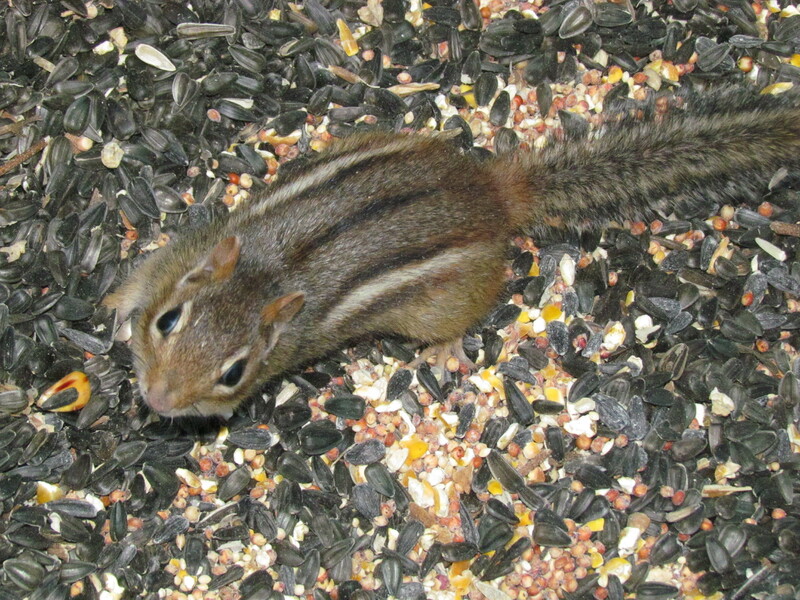 Unfortunately, some eastern chipmunks only survive one day topside. For in their hyper-speed quest for fresh morsels and mates, caution vanishes as quickly as melting snow. Predators of chipmunks include the red fox, coyotes, weasels, mink, hawks and of course, house cats. Once the weather warms, snakes join the entourage of creatures that treat chipmunks as meaty entrees. For the past four months, chipmunks were in their underground burrows. Contrary to myth, they were not in a state of deep hibernation. 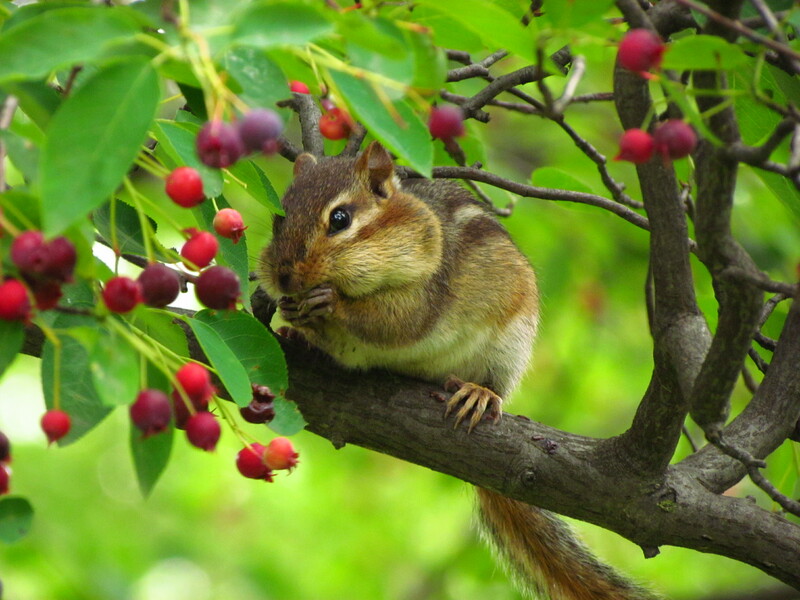 During the waning days of autumn, they scurried about gathering seeds, nuts and berries to store for winter consumption. They did sleep a good part of the winter, awakening occasionally for a meal from their cache, and then it was back to the long nap. Biologists call this nap a torpid state. Metabolism, body temperature, heart rate and respiration slow, reducing the amount of energy needed to maintain life. However, during brief warm spells, some emerged for a quick scurry above the snow, to survey their kingdom from convenient perches. In these early days of spring, they race about on dried leaves, over and under downed logs and search near piles of stones and brush for any seeds left over from autumn. If they find a good cache, their dexterous paws transfer their bounty to their expandable cheek pouches. They are omnivorous creatures; bugs, beetles, insects and sometimes, even baby birds, join their menu. Every now and then, an early spring chipmunk finds the motherlode of seed and makes endless trips from corn bins, in rural areas of Oakland County, or from seeds scattered under a bird feeder. And soon it will be time to settle down to the serious business of mate hunting. About 30 days after mating, the babies are born blind and furless, weighing only three grams. For the next four or five weeks, they are nursed underground in a nest lined with dry grasses, fluffy seed heads and leaves. By the time morels emerge and lilacs bloom, they are ready to join topside life on the Wilder Side of Oakland County and in most urban and suburban towns. 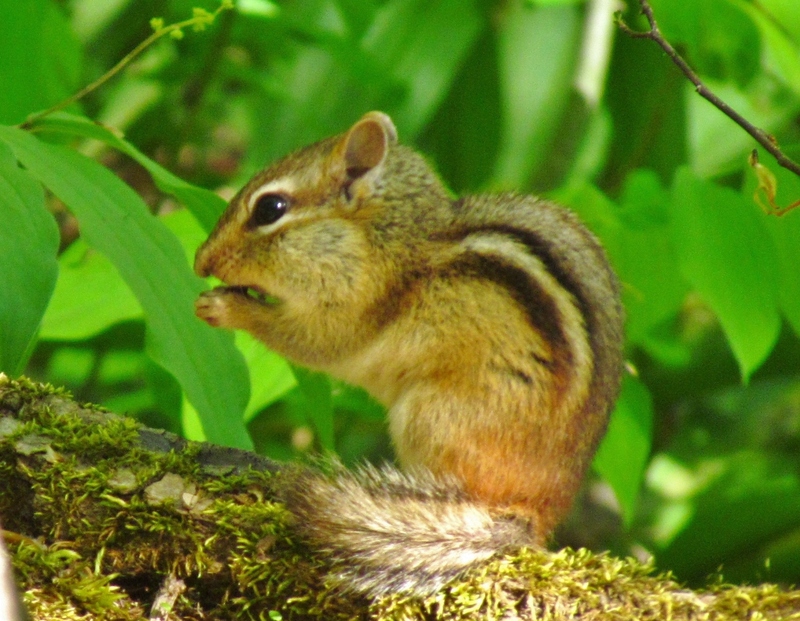 The eastern chipmunk is perhaps the most loved and attractive of our native rodents, even if predators look to them as just a meaty mouthful. 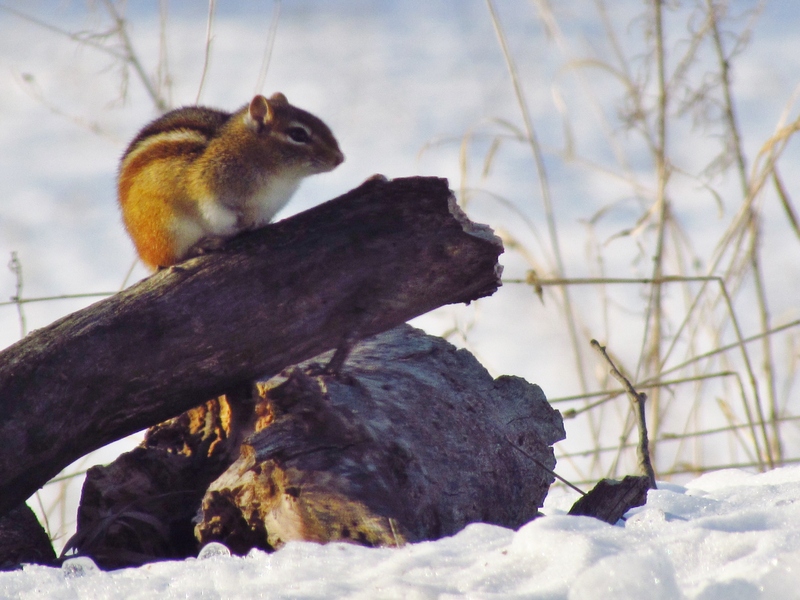 Two of the most accessible and best trails for your little ones to view eastern chipmunks are found at Independence Oaks County Park, the River Loop and Lakeshore Loop. Once there, all you need to do is find a quiet woodland place to sit and wait a bit. More likely than not, it won’t be long before you spot this creature (I will call cute) scampering about and or until you hear one chattering away with calls that sound very much like bird calls. For many children, a close encounter with a chipmunk is their first truly captivating moment with wildlife: a watershed moment for wildlife and nature appreciation. It was for me too—many, many years ago.